The South West Lakes Trust is responsible for providing and maintaining sustainable recreation, access and nature conservation on and around forty inland waters in South West England. 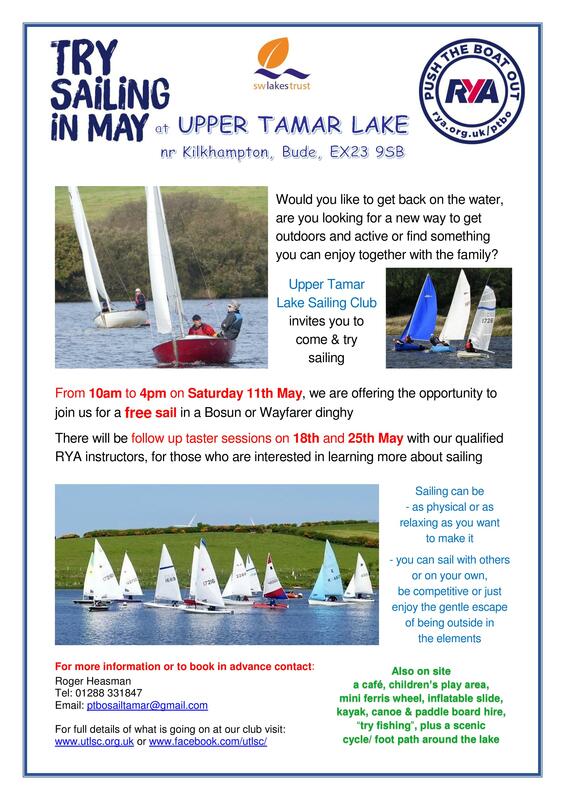 As part of this, they are responsible for watersports on Upper Tamar Lake; Matt Lennox is the Watersports Chief Instructor who is normally based at Tamar and he will be pleased to answer any questions. Lakes Trust staff provide rescue boat cover for all lake users, provide boats for hire (sailing dinghies and canoes). The Roadford Lake Sailing Club is based at another of the reservoirs where watersports are managed by the South West Lakes Trust. Roadford Reservoir is situated near Launceston, with good access from the A30. The standard website. The rain radar maps are particularly useful. If you’re looking for the recent weather (including windspeed) at a location near to Upper Tamar, then go to the ‘Latest Observations’ link on this site and pick out the data for Chivenor (which is near Barnstaple). An alternative weather site. If you click on the ‘Spot Search’ option and type ‘Upper Tamar Lake’, it will come up with two different options for Upper Tamar; click on the ‘Forecast’ option for either of these and it will come up with eight days wind speeds and other weather data for the lake. Usefully, it also gives forecast of the likely strength of gusts, as well as the underlying windspeed. The full set of current Meteorological Office surface pressure charts is available from this site. The synoptic charts are for forecast periods of up to 120 hours ahead. Note that for dates 2 to 3 days in the future, there will probably be two or more charts, all giving predicted maps for the same time (for example, 84 and 96 hour predictions both for midday on Sunday 12th); the first of the charts (in this example, the 84 hour prediction) is always the most recent.